Paintball Bonanza Paintball field is an outdoor paintball field located near Jersey Village, Aldine, Katy, and Bunker Hill Village in Houston, Texas. 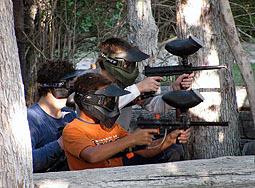 Paintball Bonanza Paintball field is also convenient to Pasadena and other cities in Texas. See the chart below for distances and drive times to other cities and points of interest. 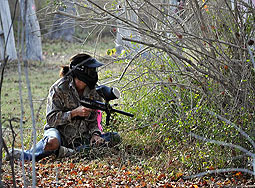 Paintball Bonanza Paintball field is one of the best decorated paintball fields in Texas. 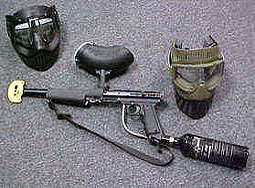 It was started and continues to be run by a paintball devote (as you might expect). He brings amazing scenarios to life and a cool perspective to create a unique and fun field. This field is one of the closest fields to the greater Houston area convenient to the medical center. Safety zone at Paintball Bonanza Everyone loves chilling at the Bonanza! 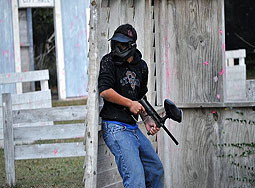 Paintball Bonanza Paintball field is located on a great big area with a ton of fun courses with amazing painted designs. Paintball Bonanza Paintball field also features a variety of field types. 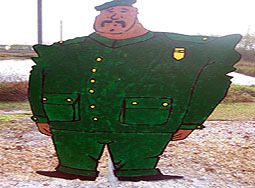 You'll find a kill house course, bunkers, and a great shooting range. One field even features a faux village. 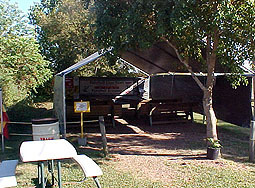 Another features hanging targets. There are also areas with painted people, and unique bunkers of various materials. 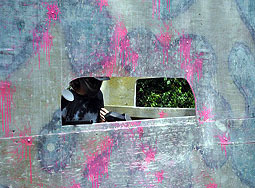 Paintball Bonanza takes practice very personally. There are tons of unique targets in this practice range. 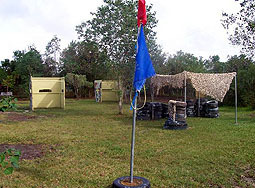 Paintball field features as target pictured above in the range to give new players and old a fun and unique paintball experience. You will find that Bonanza has taken special precautions to ensure that each part of the facility is different than what you see around at other fields. 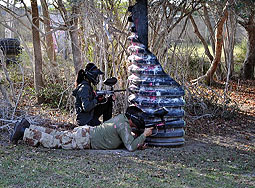 Paintball Bonanza takes safety very seriously and has dedicated the shelter above to increase awareness for player safety Paintball field lends itself to several interesting types of games. 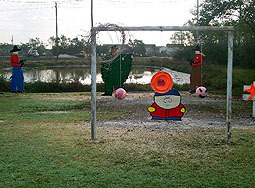 This field at Paintball Bonanza Paintball field lends itself to several interesting types of games including captor the flag and president men. Unique feature of the field having many dead boxes. The dead box or safety area pictured above may not seam like that nice of a feature to the new player but to old pros they get it right away. When paintballing some too tons of your time and energy is taken walking back to the safety are between games to get a snack or clean off paint. The beautifully thing about this facility is that they don't have that problem. there are Safety areas everywhere and you don't have to go more than a couple of steps to be able to take off you mask. You get more play time with this set up and less energy going into walking back and forth. Once you play with this type of convenience you will never want to go back to the old lame way of walking 1/4 mile between games winch is what many fields require. 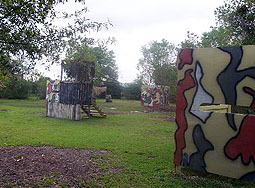 The player pictured above at Paintball Bonanza Paintball field shows several of the different terrain that are available. You will be very pleased with the many different types of fields to chose from and there playability. Getty up in to this old west theme paintball course. You can duel at high noon or mosey to the corner store to handle you business. Just make to always have you weapon ready as you never know what will happen. All the stander games can be played on this field with many variations to fit the time period. The field is very popular with birthday party's for kids and corporate groups taking down the corrupt sheriff. let you imagination sore and be free as you play on this theme section of the park. 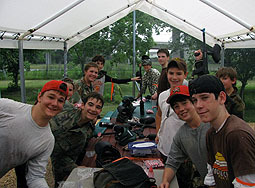 Paintball Bonanza Paintball field is a "Field Paint Only" paintball field (FPO). This means that only paintballs purchased from Paintball Bonanza Paintball field on the day of play may be used at Paintball Bonanza Paintball field. For your safety and the safety of others, the consumption of alcohol or other drugs that may impair your judgment or coordination is not allowed before or during your visit. Do not bring alcohol onto the premises. Paintball Bonanza Paintball field reserves the right to eject any player(s) without refund that its employees think may be impaired or bring alcohol or other drugs onto the premises. 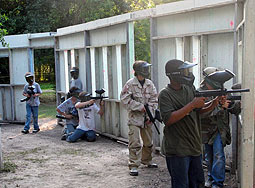 Paintball Bonanza Paintball field is ideally located for people living or traveling in Houston, Texas. This field is very close to the medical center ands is within the I 10 loop.